Espo’s once had a handful of locations, but now has only one on the “other” end of Congress St. They’re known for pretty traditional Italian Food – a “trattoria” by definition is an Italian restaurant serving simple food according to Google – in addition to large portions and an abnormally large meatball. I wouldn’t say I go there a lot, but when the mood hits me for regular ol’ Italian, it seems to be a decent choice. I’ve been there a number of times and they tend to be consistent with their product. We hadn’t planned to go out to eat, but a last minute mood led us out find some food away from home on a Wednesday night. Upon arrival, the decor and overall atmosphere was as I remembered and reminded me of old school Italian restaurants. There was a modest crowd and a thick calmness throughout the room. It wasn’t dark, but felt a little dim in a way that seemed appropriate. We were taken to a table and I sat, but I either had hot air blowing in my face or on the back of my head depending on which side of the table I was on and neither was remotely pleasant, even on a really cold evening. When the waitress came to give us waters, we immediately told her we needed a solution to the hot air blowing on us and she adjusted the vent which instantly fixed the issue. That was a welcome improvement and we were then able to fixate on the menu. I was thinking of getting an app, hopefully to share with my wife, and also an entree of some sort. To start, I was interested in the Fried Mozzarella or Basked Stuffed Mushrooms, but after some discussion with Mrs. Portlandeater, decided against an app altogether. The entree I ordered would certainly be large and anything beyond that would simply be too much. 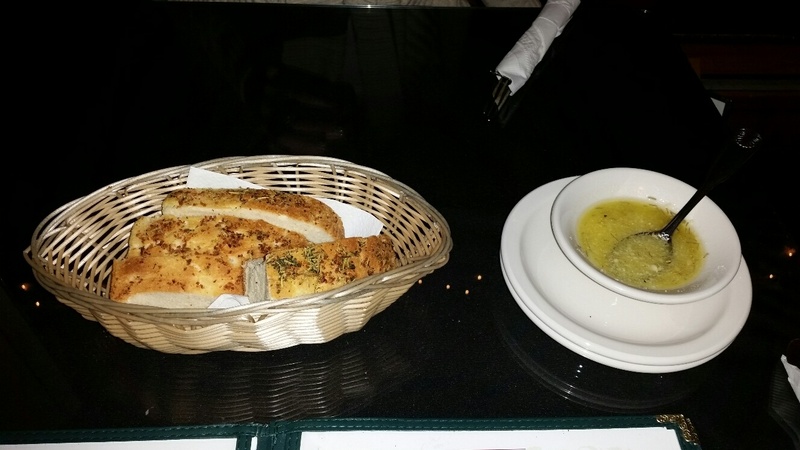 While looking for the right entree, we got some bread with cheesy, herby olive oil which was mixed in front of us. I took a piece so I would have enough energy to choose a meal. It was sliced thickly and super dense and heavy. The oil had plenty of grated parm in it and I felt it quite a delicious pairing with the excellent bread. 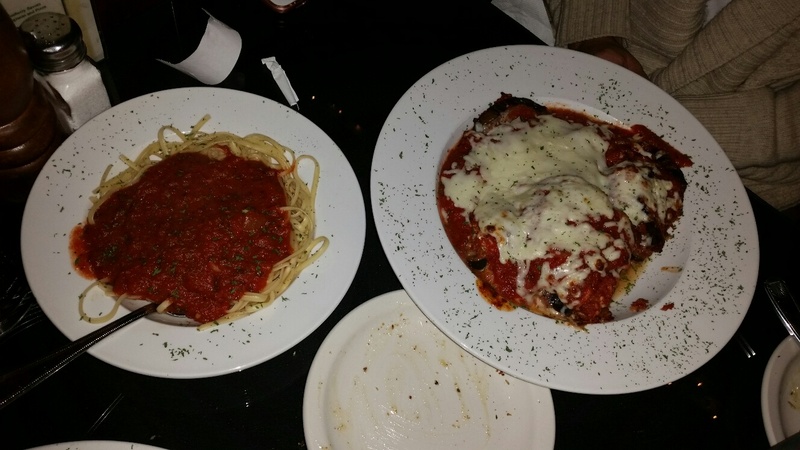 After a couple bites, I narrowed down my meal options to either Chicken Parmegiana or Meat Lasagna. My wife decided on Eggplant Parmesan – layered freshly fried eggplant baked with marinara and cheese served with choice of pasta and served with a salad. She chose linguine as her pasta. Because of her choice, I went with the Meat Lasagna – homemade cheese lasagna with sausage, pepperoni, and ground sirloin served with a garden salad. We both chose the house made Italian dressing. Our salads came out quite quickly. They weren’t anything fancy, just a simple veg mix with lettuce, tomato, cucumber, onion, and purple cabbage. I always feel a salad is required with a decent Italian meal and enjoyed mine with the dressing. Once that was done, I ate more of the bread and we waited a bit for our food. When it came, it was no surprise. The portions were massive. I accepted some fresh shredded parm on my lasagna, took a couple deep breaths, and got to work. My first bite of lasagna was huge as I tried to get a little bit of everything on my fork. I appreciated the extra cheese on top and the sauce was very tasty, but what really got my attention was the three meat madness in the Italian staple. The spicy sausage and pepperoni and glorious ground sirloin made for a superb pasta palate presentation. In my opinion, lasagna is always best with at least two meats, and three was a big plus. 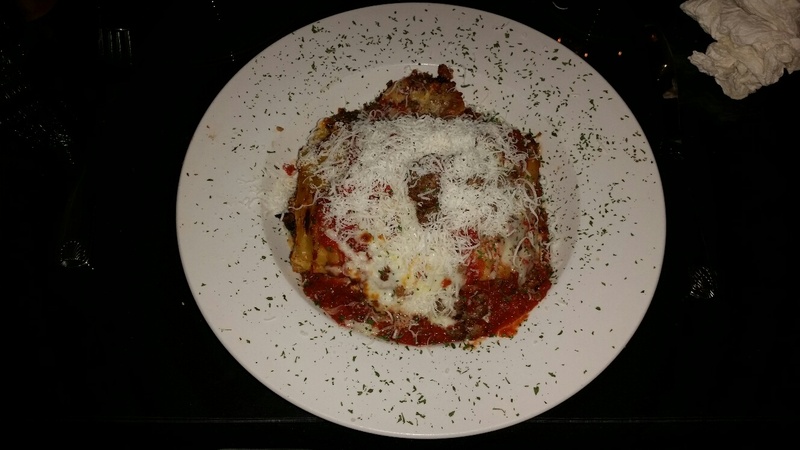 Outside of the triple meat, the lasagna was mostly the standard version, but I presumed it would be. My wife loved her eggplant and there was much more of both her parm and pasta than she could eat in a single sitting. She worked until totally full and so did I, though I was able to finish it all. We had the rest of hers boxed to take home which was plenty for another meal. At $18 for my food and $13 for hers, the meal was affordable. I wasn’t looking for a big mid-week spending spree at a restaurant and they delivered exactly what I needed without breaking the bank. In addition to Espo’s reasonable prices and monster portions, the food is really good. It’s not extraordinarily inventive, but it doesn’t need to be. They serve up traditional Italian with high quality ingredients. They also have a nice drink list, and though I didn’t take advantage of it this time, I have in the past. They did have a number of interesting winter cocktails available when I was there. 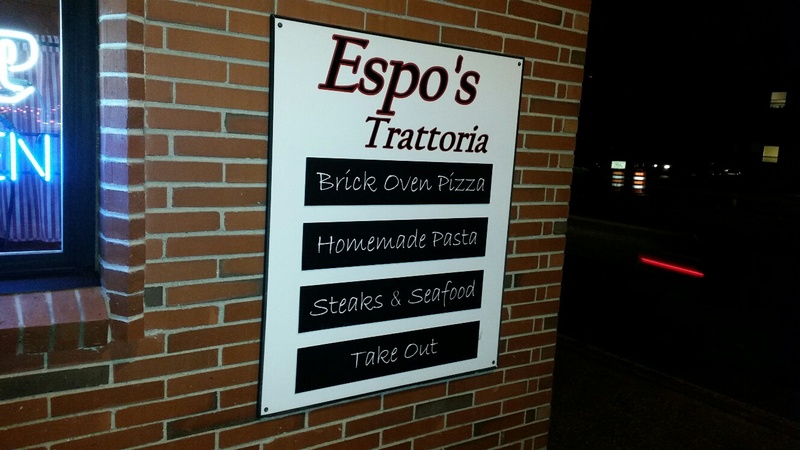 I’ve been to Espo’s quite a few times, and while I only ordered one item – a very rare occurrence for me – I can vouch for many on the menu. Try the fried mozz, meatballs, chicken parm, or any of their great traditional Italian food. You be well fed and then some. This entry was posted in Portland, ME food on December 30, 2016 by peterpeterportlandeater.